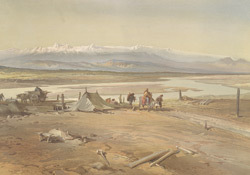 This chromolithograph is taken from plate 22 of William Simpson's 'India: Ancient and Modern'. The Chenab is one of the five rivers of the Punjab (the others being the Sutlej, the Ravi, the Jhelum and the Beas), all of which feed into the great River Indus. In the distance is the Pir Panjal range surrounding the Vale of Kashmir.